Although it looks like it might be a music player itself, the Creative Xmod Xtreme Fidelity gadget is actually used to improve the sound of you music for your existing player. If you really like your music to be crystal clear with the X-Fi Xtreme Fidelity standard from Creative you might want to look into this. 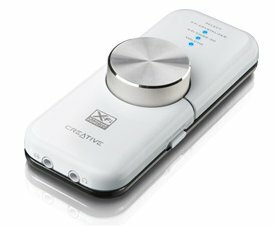 The Xmod device goes inline in between your player and the speakers or headphones that you are listening to, and actually improves the quality of the music beyond that of CD quality, according to the press release at Creative.com. Well… I guess smoking might not be considered so cool, and maybe drinks aren’t the best thing to be setting on your PC, but if you are going to be smoking and drinking at your desk anyway, then “How cool is this!!”. 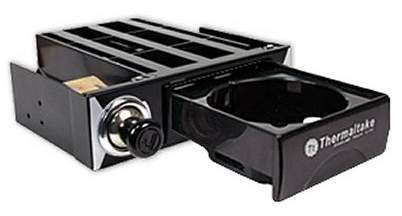 This is the Thermaltake X-Ray Cigarette lighter adapter and beverage holder. It fits into your 5.25″ drive bay and runs off of the power adapters in your PC. The cigarette light works like a cigarette lighter would in your car, and the beverage holder actually has an eject button to run it in and out like a disk drive. You are out a phone and you have to buy another. The data on the phone might be private and you don’t want someone else to have it. The guy that stole your phone has one for free. Well, chances are you’re out of luck for #1, but Synchronica might be able to help you with numbers 2 and 3. With Synchronica’s phone management software calle Mobile Manager you can take some action when you find your phone is missing and possibly stolen. Epson has introduced the Stylus Pro 3800 – a compact, 17-inch wide printer design with a new breakthrough screening algorithm and award-winning Epson UltraChrome K3 Ink technology. This sleek and sophisticated printer is targeted towards the printing needs of professional photographers, graphic designers, and prepress proofing. For added productivity, a new auto-sharing black ink technology allows for automatic switching between photo and matte black ink modes to maximize image quality on a wide variety of media types. The Epson Stylus Pro 3800 will begin shipping in December 2006 and has a MSRP of $1,295 (USD). Epson will also make a Professional Edition of the printer that includes a high-end PostScript Language Level 3 compatible RIP by ColorBurst and is priced at $1,495. D-Link recently introduced its line of ‘V-CLICK’ dual-mode phones. These phones will allow users to easily switch between cellular and Wi-Fi networks with the click of a button. The V-CLICK phones have a compact form factor (4.17″x1.73″x.75″) with a two-inch (176×220 pixels) screen. The V-CLICK phones support the Opera MobileTM mobile browser. The V-CLICK is expected to ship 1st quarter 2007. I think it is time for me to get a new keyboard. Logitech today announced its new ultra-slim diNovo Edge Keyboard. The diNovo is a minimalist work of high-technology art. The diNovo is laser cut from a single, semi-translucent piece of black Plexiglas and set into a brushed-aluminum frame which is an anorexic Â¾-inch thick. 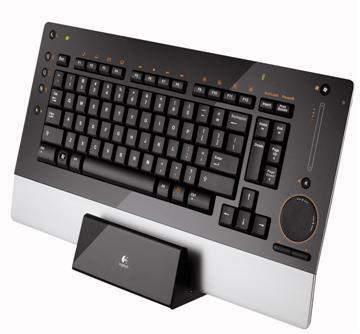 The diNovo also breaks new ground in technology as it becomes Logitech’s first rechargeable keyboard. The diNovo also features an integrated touch-sensitive navigation and scroll panel, and includes embedded Bluetooth wireless technology. The Logitech diNovo Edge keyboard is expected to be available in the U.S. and Europe beginning in November witha MSRP of $199.99 (USD). Desktops are really becoming more popular as things are becoming more wireless in general. The new wireless keyboard and mouse combination from Logitech further enhances the move towards disconnected innovation, and is doing it with some style. A really nice feature with the DiNovo Edge which is not common in other similar desktops is having mouse-like navigation on the keyboard. Anyone that has had their keyboard sitting on their lap while leaning back in their chair has encountered the incredible inconvenience of finding they need their mouse for something. Having the Logitech TouchDisc on the keyboard can eliminate the need for your mouse and let’s you lean back and relax a little while working. This is what I like to see. Another mobile phone that is breaking the mold. 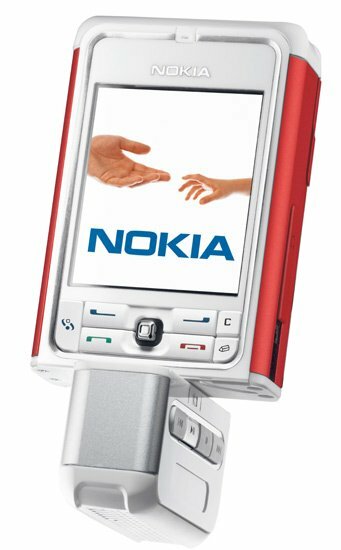 Too much emphasis has been placed on being so thin and it’s nice to see Nokia tout the full-figured look with their 3250 XpressMusic. Another credit to their design ingenuity for not making this phone with a clam shell design, but more so for taking a different angle and making the design so that the base of the phone twists to perform different functions. The plusID line of secure, wireless devices is dubbed as the world’s first personal biometric fingerprint fobs. The plusID provides secure access to multiple facilities, computers, and networks. Security with biometrics has never been easier, more economical, or widely accepted. The plusID works with select off-the-shelf logical access / single sign-on software applications, and can be easily configured to support one-time password functionality. The plusID can be added to existing physical and logical security environments with no changes to installed infrastructure. 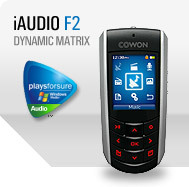 Cowon Systems recently launched the sophisticated ultra-mini MP3P, the ‘iAUDIO F2‘. The iAUDIO F2 incorporates a stylish and unique design into a user-friendly and functional player. You can play videos and view text or images with the 260,000-color high definition LCD – all while listening to music. The 1.3 inch TFT-LCD allows users to navigate all the device operations with ease. The 9 function buttons are integrated on the front control and can easily be operated with one hand. The iAUDIO F2 can be used as a pendant as it weighs in at an unnoticeable 39g (including battery) ensuring for exceptional portability. The built-in lithium polymer battery provides up to 22 hours of continuous play with just 3 hours of charging. 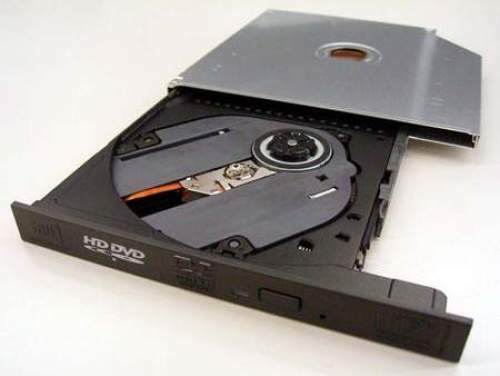 Toshiba has announced the first HD DVD drive that can read and write HD DVD’s, regular DVD’s and CD’s and is a slim design to fit into a notebook computer.The SD-L902A is only 12.7 mm high so that it it fits into the slim space necessary for laptop computers and other devices that conform to the cramped space. With the increasing demand for HD media and sales of high definition televisions and HD camcorders, the need for the ability to write and edit this type of HD media at home and with a more mobile PC such as a notebook is a natural progression. The new SD-L902A HD DVD drive is going to be demonstrated at the CEATEC conference in Japan the first week of October. If you happen to be there, they are at booth 1A09. The PP01 is a digital radio that has been designed to complement and enhance even the most beautiful and sophisticated living and working spaces. The PP01 has a super-slim footprint which allows you to personalize it with your own design or photo. Intempo has teamed up with the folks at mybiggerpicture.com to print personalized speaker covers for Intempo customers. The PP01 works by swapping the interchangeable speaker cover for one that suits your style or mood. You can choose from a variety of standard pop-on covers or use your creative energies to make your own designs or use your favorite picture. This new MP3 player from Sony definitely has the athlete in mind when they designed it. When you look at the NW-S205 Walkman it has athlete written all over it, beginning with the small and sleek design. 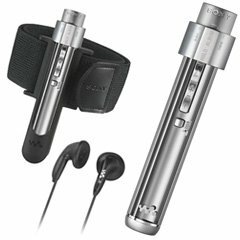 The NW-S205 (part of the new NW-S200 series from Sony) is only 3.8 inches long and has a diameter of .6 inches. The trade off for having something this small is the interface. It only has a one line small visual interface for reading the information, and some small twist and rocker controls to navigate, but once you get it running you are set. 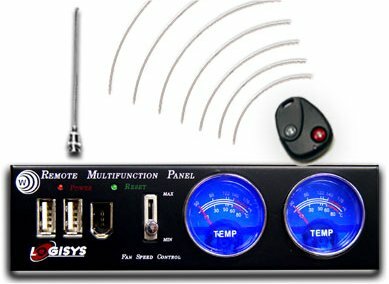 In response to the increasing requests for non-mainstream customizations to personal PC’s Logisys has come out with a Remote Multi-functional Panel for your PC. The panel fits flush into a 5.25″ bay in your PC and can be used to boot and/or reset the PC remotely with the included remote control that is similar to a car key fob from up to 15 feet away. This multifunction panel comes in black or silver, and has two temperature gauges to monitor the temperature of your hard drive and CPU. There is also a switch to adjust the fan speed, two USB 2.0 ports and one Firewire port. 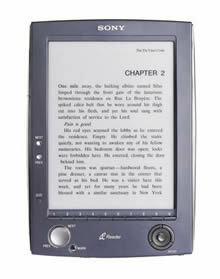 Sony has announced the release of its new eBook – the Sony Reader. Boasting a revolutionary screen that reads like paper, the Sony Reader comes in a very compact and lightweight design that you can take anywhere. The screen is daylight-readable, high contrast, high resolution, and a boasts a near 180Âº viewing angle. In addition, the text can be magnified for sight-impaired readers. The Reader measures 6.9″ x 4.9″ x .5″, making it smaller than many paperbacks. Weighing in at about 9 ounces, its light enough to travel with you everywhere you go. The rechargeable battery powers you through up to 7,500 page turns, so you’re ready for that exciting page-turner, and can be recharged in 4 hours with the AC adapter.